Coat Rack With Marble Base and 14 hooks. Available In Three Colors: Natural, Silver And Burgundy. Strong Construction. Easy To Assemble. Beautifully finished with chrome details. Size: 70 In. Height. Graceful twist hall tree is enhanced by a warm Nostalgic Oak finish. Features a revolving coat and hat rack. Ideal accent for any home or office. Minor assembly required. Size: 72 In.H x 20 In. Diam. Metal Coat Hanger in Black Finish. Easy to assemble. Strong construction. Solid marble base. Oak Finish Coat Rack. Easy To Assemble. Dimensions: 19-3/4 In.(L). X 19-3/4 In.(W). X 72-3/4 In.(H). Walnut Finish Coat Rack. Easy To Assemble. Dimensions: 17-3/4 Wide. X 71 High. Oak Finish Coat Rack With Twist. Easy To Assemble. Dimensions: 19-1/2w. x 71-1/2H.. Proof That Organization Doesn&#8217;t Have To Be Boring, This Stylish Textured Ivory Finished Coat Rack And Its Graceful Scroll Detail Is Sure To Be A Welcome Addition To Your Home Or Office. With Plenty Of Hooks For Hats, Coats, Jackets Or Scarves, The Baskets Add Additional Storage Space For Umbrellas, Small Totes Or Mittens. This Coat Rack Features 16 Decorative Scroll Hooks And Legs And Two Rattan Baskets For Storage. Durable Metal Construction. Easy To Assemble.Dimensions:Coat Rack:18.5 In. x 18.5 In. x 72.5 In. (H)Large Basket: 13 In. x 17.5 In. x 17.5 In. (H)Small Basket: 13 In. x 7.5 In. x 7.5 In. (H)Also Available In Black Finish. See Related Items Below. Satin Black Spider Coat Rack. Strong Metal Construction. Easy To Assemble. Dimensions: 20W. X 73H..
Metal Half Coat Rack. Easy to assemble. Strong Construction.Weight:15.4 lb Dimensions: 28 In. x 12 In. x 21 In. Eight Hook Coat Rack In Black. Easy To Assemble. Dimensions: 19W X 70H. *In stock. This product normally leaves our warehouse within 1-2 business days. * Quantity Discount Available. Proof That Organization Doesn&#8217;t Have To Be Boring, This Stylish Textured Ivory Finished Coat Rack And Its Graceful Scroll Detail Is Sure To Be A Welcome Addition To Your Home Or Office. With Plenty Of Hooks For Hats, Coats, Jackets Or Scarves, The Baskets Add Additional Storage Space For Umbrellas, Small Totes Or Mittens. This Coat Rack Features 16 Decorative Scroll Hooks And Legs And Two Rattan Baskets For Storage. Durable Metal Construction. Easy To Assemble.Dimensions:Coat Rack: 18.5 In. x 18.5 In. x 72.5 In. (H)Large Basket: 13 In. x 17.5 In. x 17.5 In. (H)Small Basket: 13 In. x 7.5 In. x 7.5 In. (H)Also Available In Ivory Finish. See Related Items Below. Multi-Colored Coat Rack. Easy To Assemble. Dimensions: 17-1/4L. X 17-1/4ÃW. 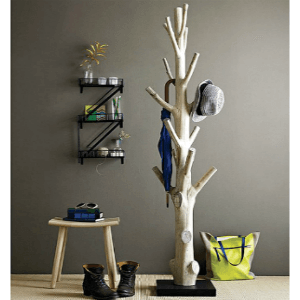 X 70-3/4H..
Moonlight Coat Tree, hall tree. Black with chrome hardware. Features: Coat tree. Ebony finish with wood grain. Six chrome hooks. Unique curvature design prevents garment entanglement. Assembly required. Actual size: L 15 1/4 in. x W 11 1/4 in. x H 65 1/8 in. Heavy Duty Solid Metal Coat Stand With Marble Base. Easy to assemble. Available in Beech, Silver and Mahogany.Size: Dia. 18.5 In. (W) x 73 In. (H)Normally Ships in 1-2 Business Days. Discount Available For Product and Shipping For Large Orders. Moonlight Coat Tree. Features: Coat tree. Natural wood finish with wood grain. Six chrome hooks. Unique curvature design prevents garment entanglement. Assembly required. Actual size: 15 1/4 in. x 11 1/4 in. x 65 1/8 in.